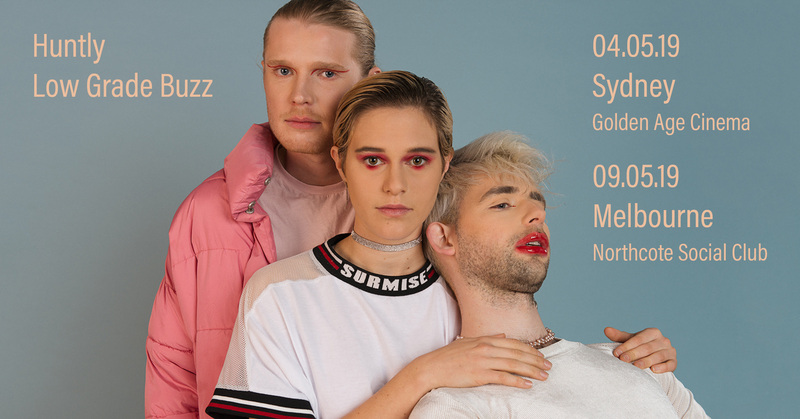 Over the last six months, Melbourne trio Huntly have announced themselves with a string of extraordinary singles; each song a unique slice of intricate and intimate electronica which pushes the boundaries of contemporary pop and dance. Now finally, after years of honing their craft, Huntly have arrived with their entire debut album – beautifully constructed and deeply personal, Low Grade Buzz – out today via Barely Dressed/Remote Control Records. Doubling down on their “doof you can cry to” manifesto – their combination of profound song-writing and forward-thinking dance music production places them in the canon of cutting-edge pop artists. Where other writers would reach for empty platitudes, Elspeth digs deep with alarming clarity in their critical self-reflection. ‘Giving Circle’ opens with the disclaimer, “I’ll admit that I wanted to hate you”, and leaves nothing unspoken, accompanied underneath by the community choir Elspeth directs. On tracks like ‘Vitamin’, Elspeth sings as if giving us a window into the band and their process of art-making: “I’m always tryna find new ways to approach it, a project of self and others”, or album-opener, ‘SMU’: “even if our histories are incompatible, even if knowing our survival feels unfathomable”. Elspeth’s capacity to capture and communicate life’s bittersweet ache truly shines in the album’s understated title track, ‘Low Grade Buzz’. Percussionist and producer Andy oversees most of the production on the album, across all eleven tracks, every beat feels perfectly timed. The lurching and uneasy swing of the beat on ‘AUR’ acts as the perfect bedrock for Elspeth’s achingly honest narrative and snares fly chaotically around a powerful sub in the garage-inspired coda on ‘Wait (37 degrees)’. Andy displays a capacity to connect music and narrative across the entire album, but especially on lead single ‘Drop Gear’. The cathartic sub drops act as a speed-racer halting suddenly and “dropping down a gear” to avoid a crash. Singer/Producer Charlie could be the band’s secret weapon on Low Grade Buzz, deftly switching between roles as singer, songwriter and producer. Their rough and slightly unhinged vocal delivery works as the perfect foil to Elspeth’s vocal mastery. On tracks like ‘Wiggle’ or the swampy interplanetary grooves of ‘Vitamin’, Charlie sits as Elspeth’s devil’s advocate, the track in question becomes a dialogue; an expression of differing perspectives and styles. Commencing with nothing but piano and heavily-affected voice, Charlie’s presence in ‘Wait (37 Degrees)’ is like an incantation from some future cyborg religion. The album traverses a spectacular range of musical territory, while still managing to form a cohesive whole. From the forward-thinking emancipatory banger ‘Wiggle’, to carefully constructed pop of ‘Reckoning’, to the fierce intensity of ‘Wait (37 Degrees)’, this is an album that pays homage to the conventions of pop and R&B, while also proving unbound by them. Like the title track, ‘Low Grade Buzz’establishes something evocative, intense and unique, the work proves to celebrate the trio’s extraordinary individual strengths, while showcasing their collective craft – in a whole that is still more than the sum of their parts. Catch Huntly live in Melbourne and Sydney this May to launch this incredible album. Details below.